This article describes a simple example of how to create Unigine native GUI by using User interface (UI) files. 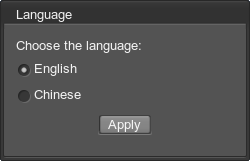 To get access to the widgets from the script, you must specify the name parameter and set the export parameter to1 for each of them. To set the callback for the widget, simply define callback as a child tag and set the required value for itstype parameter. Also the callback function must be defined in the script. 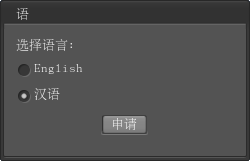 To be shown correctly, the Chinese font file (for example, font_ch.ttf) should be added to the project folder and loaded when it is necessary. When the *.ui file is created, the GUI is described, the dictionary is prepared and all the necessary fonts are added to the project, you need to add a script logic. The name of each variable must match the name of the widget defined in the UI file. To set the root widget alignment via scripting, define one of the GUI_ALIGN_* pre-defined variables as the second argument of the addChild() function. The first radiobutton was checked. The second radiobutton was checked.